With these words, New York Times journalist J. B. Collins, reporting from the scene of a devastating attack by ISIS terrorists in Amman, Jordan, puts the entire world on high alert. The leaders of Israel and Palestine are critically injured, Jordan’s king is fighting for his life, and the U.S. president is missing and presumed captured. As the U.S. government faces a constitutional crisis and Jordan battles for its very existence, Collins must do his best to keep the world informed while working to convince the FBI that his stories are not responsible for the terror attack on the Jordanian capital. And ISIS still has chemical weapons . . . 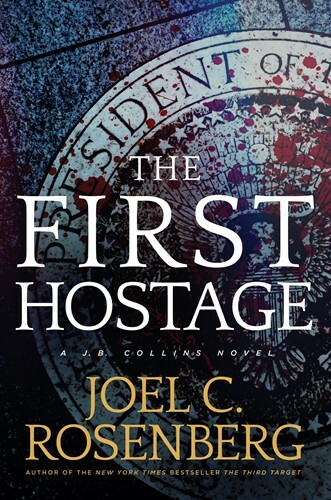 The First Hostage is the continuation of the events started in The Third Target which I reviewed here. ISIS has attacked the peace talks, and the president of the United States is missing. J. B. is invited into the inner sanctum with the King of Jordan and other world leaders to report on and assist in the hunt for the U.S. president. When all the obvious hints point to the POTUS being held in one location, other clues and J.B's brother, point to him being somewhere else. Which location is the correct one, and can they get there in time to save the president? As with all of Joel Rosenberg's books, this one is fast paced and full of intrigue - there are also a few stomach turning moments, but all in the name of accuracy, considering the subject being written about. I recommend this book to anyone who is interested in reading about current events, whether they be fact or fiction reflecting the fact. I purchased this book for my own collection, and was not required to give a review.